One of the things I’m keen to do with STOMP is to make sure that it is accessible as possible. Thrust-style games are fairly tricky beasts if you’re not used to them, so I want to make sure that newcomers can have a pop at this one at a level that suits them, and also experience everything the game has to offer. Here’s how I’m going about that. First off – and the most obvious approach – the game features difficulty levels (currently easy, normal and hard – but I may well expand this, if only to add some super-hard stuff). The difficulty levels aren’t fully implemented yet, but they affect things like enemy fire rate, bullet speed, accuracy etc, rather than just altering the hit points of enemies (which currently I don’t plan to do). I’ll probably extend this so that the easy difficulty level also mitigates damage taken from enemy fire and impacts too. On top of that I’m also giving the player the option to turn on invincibility to play the game. This makes them impervious to damage (obviously) but also grants unlimited fuel (and by association therefore grants infinite shielding). This allows the player to practice the tricky control method in safety without having to endlessly play the tutorial level where they’d be largely safe. They can play the whole of the main game this way (in each of the difficulty levels), and unlock each of the levels for single level replay too. The only thing that will be restricted when playing with invincibility activated is posting highscores (although scoring potential will be reduced anyway, since the game won’t award low-damage and fuel remaining bonuses to invincible players). This ensures that anyone at all can see all the content in the game that they’ve bought. The game also features bonus mini-games. I’m hoping to have 24 of these – 3 for each of the game’s 8 levels. One of these will be unlocked by collecting a pickup hidden in each level – it doesn’t matter if you do this whilst invincible or not really (whilst it’s true the freedom to explore given by not having to worry about fuel makes this easier, there’s no point in making the player do it again “properly” once they know where it’s hidden). The other two are for completing each level with a good score, and a fast time. These will still be unlockable with invincibility on – but because they’re skill-related these will only be partially-unlocked if you do it that way. You will be able to play the mini-games (which is the important thing), but the unlocking won’t contribute towards completion of the game (and any achievements I happen to tie to that), which only really matters to people who care about that sort of thing. You will still need to hit the goals normally to achieve completion. Beyond that, in the menu I’m giving the player options to unlock the main game levels and each category of mini-games at the press of a button anyway. You don’t even have to play the game once to get at all the content. Why? Why not? The player will have paid for it, and it makes no sense to wall them off from it. If they aren’t skilled enough to beat the time or score I set for a level – or if either of those goals don’t really appeal to them – I’m happy for them to get the content without jumping through the hoops I’ve set up. And if I’m allowing the player to unlock them whilst invincible, then the only thing standing between the player and the levels is their time – something I’m loathe to waste. People who care about unlocking things the way I’d like them to are free to ignore these options, and gain the satisfaction that that provides. People who don’t can just cut to the chase. 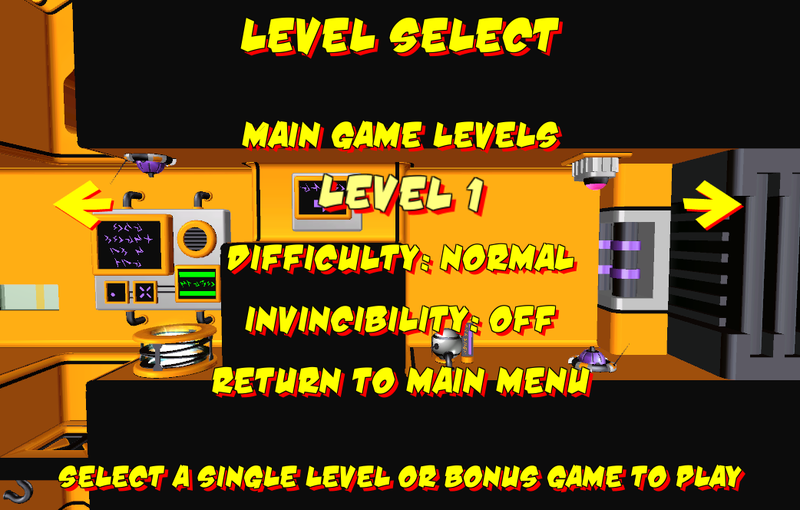 As with using invincibility, these options only partially unlock the levels – if you want achievements and completion you still have to actually do what the original goal was. I also plan to allow to allow the player to lock these things again (although I’ve just realised I can do this on two levels – lock everything (to wipe the slate clean so that it can be done all over again) or just lock those that haven’t been fully unlocked already – more feature creep, perhaps). There’s an added advantage to this too. I’ve personally played many games to death on one machine, and then installed them on another and been annoyed that I couldn’t get at my favourite bits until I’ve unlocked them all over again. This fixes that. This is the sort of stuff I’d love more games to look at doing. I can count all the novels I’ve started reading and not finished on the fingers of one hand. I’ve lost count of the number of games I’ve given up when encountering difficulty spikes. I’m not a big fan of story in games, but still it annoys me that each of those is an unfinished story that I’d have happily followed to the end if the game had let me. Why not let me toggle invincibility and bludgeon my way through it? The game can withhold achievements from me for wussing out by all means, but it doesn’t have to deny me access to the rest of the game I paid good money for just because I can’t beat a particular collection of poorly-judged design decisions (usually a boss fight).